Global NCAP, a non-governmental crash test rating agency, tested the India-spec Tata Nexon and awarded it a four star rating. Global NCAP also noted that the Nexon’s structure was stable during the crash test and that it could withstand higher loading, which essentially means that the compact SUV is a strong vehicle. Global NCAP praised the overall safety offered by the Tata Nexon. 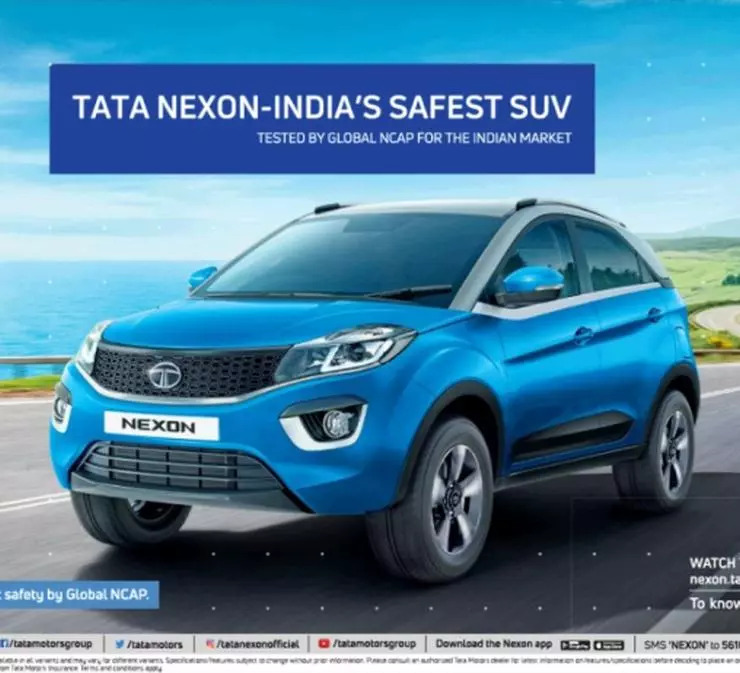 Now, Tata Motors has come up with a web ad that proudly talks about the Nexon’s 4 star crash test safety rating. The ad also calls the Nexon India’s ‘safest SUV’. Now, this can be quite debatable as there are vehicles such as the Ford EcoSport and the Hyundai Creta, which have also received high NCAP ratings, but Global NCAP is yet to test the India-made versions of these SUVs. As there’s no real comparison available to the Tata Nexon’s 4 star rating yet, Tata Motors may be able to project the Nexon as India’s safest compact SUV, at least until Global NCAP tests other sub-4 meter SUVs such as the Ford EcoSport and the Maruti Brezza. The Tata Nexon sold in India gets twin airbags and ABS as standard safety features across all trims. Ever since its introduction in India nearly a year ago, the Tata Nexon has consistently been the automaker’s best-selling SUV. Sharp pricing is one of the biggest reasons for the Nexon’s success in India as the sub-4 meter compact SUV undercuts all its rivals including the best-selling Maruti Brezza and the Ford EcoSport. Prices of the Nexon start from Rs. 5.85 lakhs, ex-showroom, Delhi, making the SUV superb value for money. It’s sold with two engine options, both of them turbocharged. The petrol motor makes 108 Bhp-170 Nm while the diesel engine puts out 108 Bhp-260 Nm. Both engine get 6 speed manual and AMT options.